Bunnies!!!! Hope everyone had an awesome long weekend. Have a great Sunday too! I’m moving so posts might be sparse or non existent during the next couple days. I’m going to try and get some in, but I’m not promising anything. You know how it is when operators move into new operational environments. Bam, it’s okay Mike. Let my manage the blog for a few days while you move. I’m totally trustworthy, right? 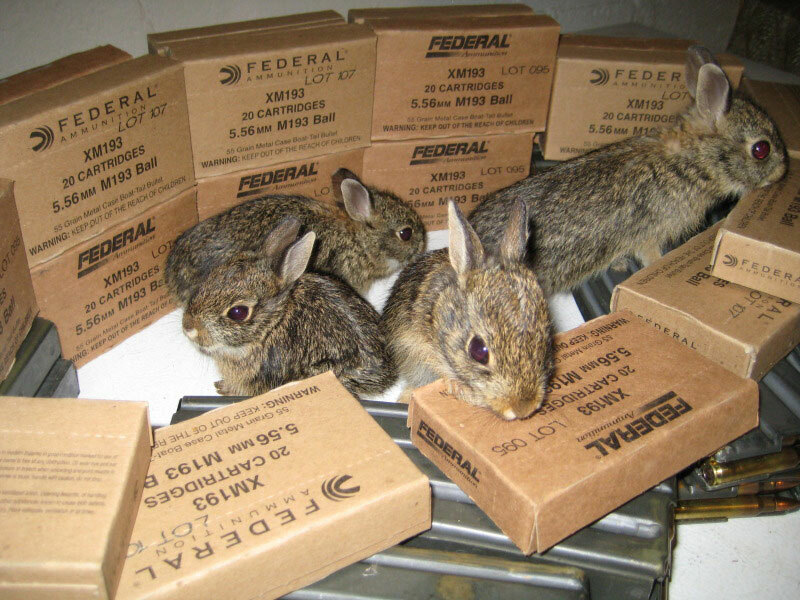 What I’d do to get a case of XM193 right now…bunnies look delicious. Good luck with the move Mike, and hello everydaysomedaysoff. Happy Easter. Enjoy the move. But isn’t 5.56 a little overkill for those bunnies? haha oops, fail. Thanks I fixed it. mike clearly recycled 2012’s easter post. No one has that much ammo these days, guard bunnies or not. I don’t even have the words to convey how much I like this photo.